Life is unexpected. The least expected things happen in an instant and sometimes leave us devastated. For instance, let us assume that a major tornado hit your city a few days back and resulted in significant damages to a number of homes, including yours. While the whole incident cannot be undone, an ideal approach should be to get the damage occurred at your home repaired in the right way and continue with your life. This is where these repair quote template and Quotation Samples can be helpful. 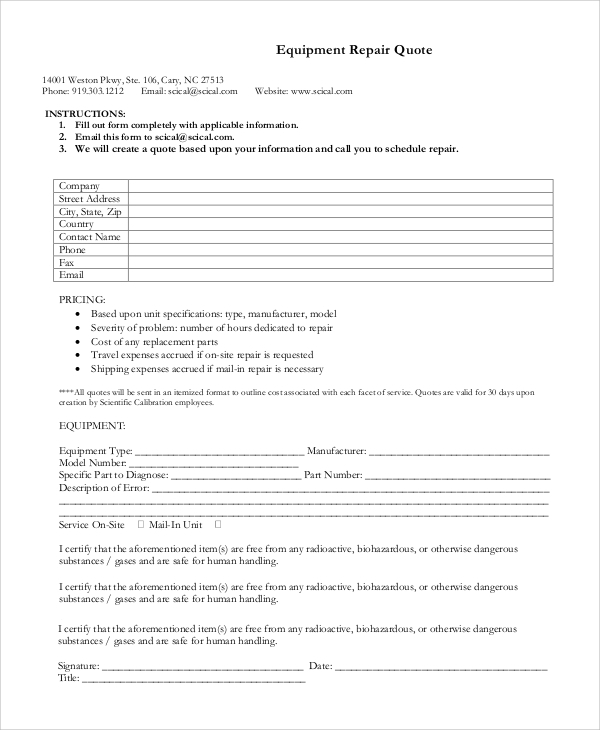 Just like home repairs, these templates can be used for a variety of applications. 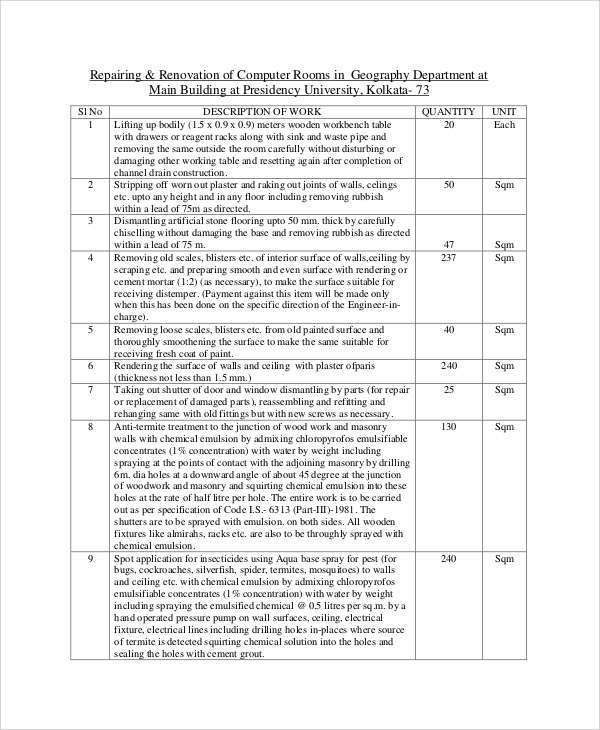 If you are in-charge of the computer room of a university or an office, the computer room will need timely repairs to keep up with the requirements. 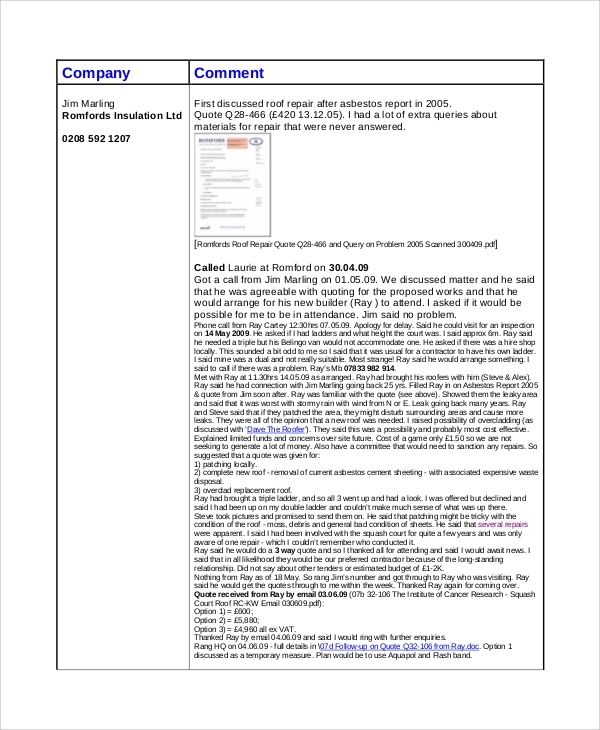 One can use these computer repair quote sample to invite quote from multiple vendors and then choose one based on the quote and reputation of the vendor. 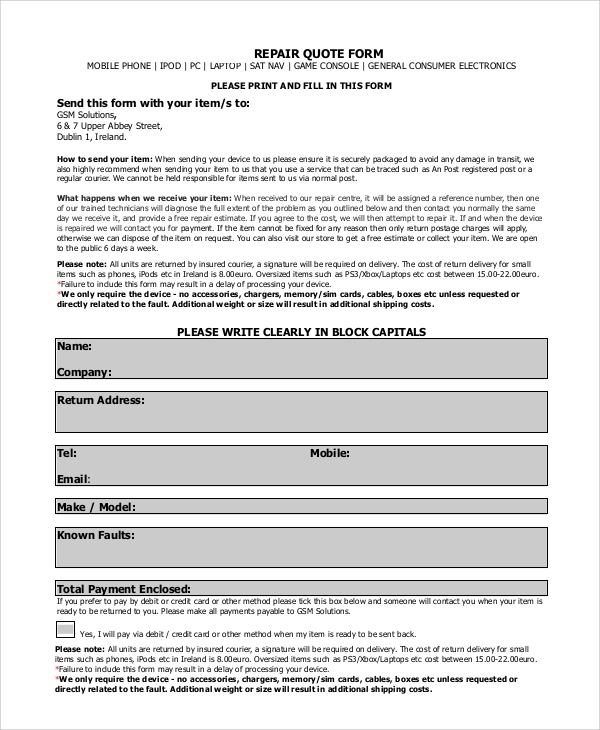 Repair quote templates can be used for a variety of applications and many different types of templates are made available here. Be it home repair, an equipment repair, or simply repairing a mobile, these templates can be downloaded with a single click and then edited as per your requirement. 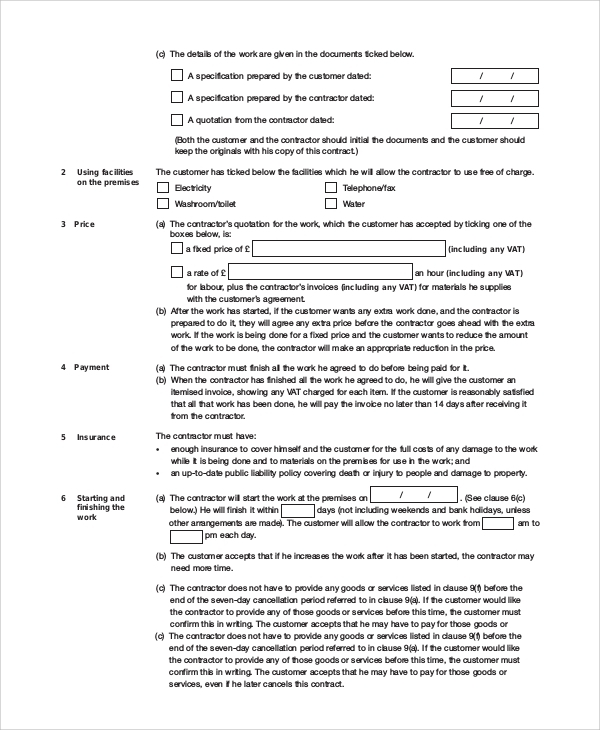 Moreover, one can also take reference from these templates to create their very own repair quote. You can also see the Price Quotation Samples. If the roof of a particular home or an entire building needs to be repaired, this quotation sample can be of great use. This sample is a professional format with a detailed description of the repair work as well as the cost of the services. If any major home repairs work needs to be done, rather than choosing any service provider, it is better to take quotes from multiple providers to make the right selection. This repair estimate template can be used for that purpose. While creating a repair quote, it is very important to make sure that the repair work is clearly described to ensure that the service provider is able to provide an accurate quote. This will make it easier for you to choose a service provider from multiple options. You can also see Sample Job Quote. 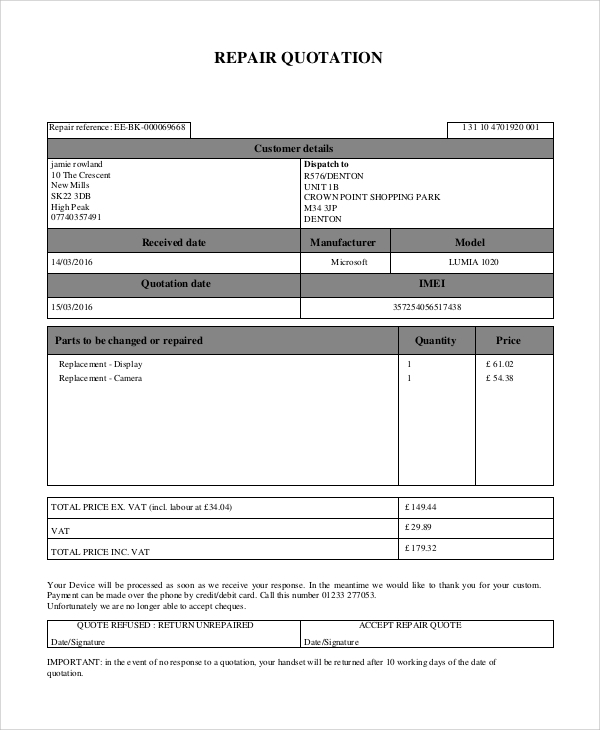 If a mobile, PC, laptop, iPod, or any other general consumer electrical item needs to be repaired, this repair invoice template can be of great help. It can be sent along with the electrical item to allow the service provider to easily understand the malfunction that needs repairing. You can also see the Quote Proposal Samples. How to Choose a Repair Quote Samples? Choosing a repair quote template is easy. As many different types of templates are available. One only needs to select and download the one which accurately suits their requirement. And if at all, the type of quote template you are looking for is not available here, you can take reference from these samples to create your template. Creating a repair quote can be difficult, especially if the problem is complex and requires major repairs from a professional. One can easily download any of these templates, like computer repair quote, roof repair quote, or Service Quote Samples and easily edit them to make the quote creating process easier and quick.